Why are we calling it a “Migrant Crisis”? Content Note: discussion of migration, racism, racialised masculinities, masculinity, gendering of migration, colonialism, imperialism, Euro-centrism, dehumanisation of black and brown bodies. “Migrant crisis”. These two words have become so overused as a label to term the plight of non-white human beings deemed “problems” to the European continent, that they have lost any poignancy they may once have held. I saw an article yesterday headlined something like “The Photo that is changing people’s views about Migrants”. I looked at it. A photo of a crying man clutching his children having arrived at Kos (see right). To me, the only way this photo would change your view about migrants would be if they were not human beings to you in the first place. If they were so dehumanised to you, that you forgot they could feel. If they were so “they” to you, that they were simply figures and numbers. If it takes a photograph to prove to you that migrants are people, then we are truly in troubled times. And call me cynical, but the voyeuristic nature of the photograph and how badly it appeals to the white-gaze just adds to the disgraceful tone of the entire situation. Realistically, by calling it a “migrant crisis” we are shying away from what is going on in the world. Violence and terror is being perpetrated on brown and black people, sending them to flee from their own homes for survival. These are not migrants. At the very least these are refugees, but this is not a “migrant crisis”. 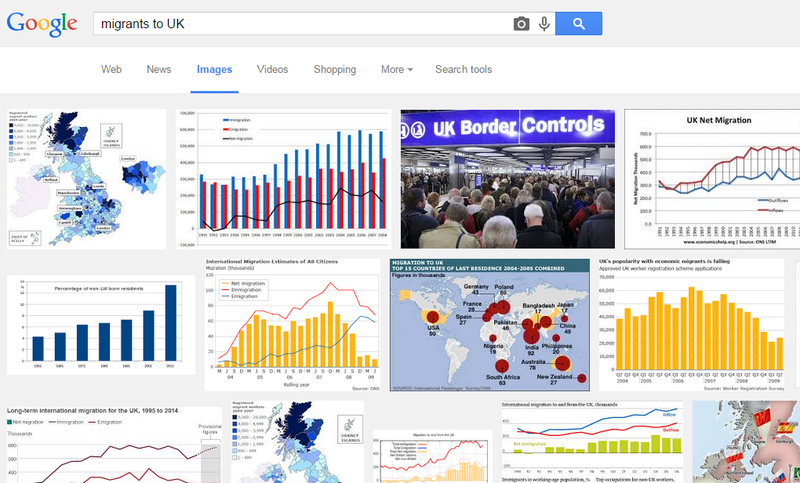 A cursory google-search of “migrants to UK” shows only graphs and maps, no faces, no people. The media-made, UKIP fuelled, and government condoned discourse, especially in the UK, is one wherein “migrants” are synonymous with “problem”. Throughout the 20th century “migrants” were problems. The Jews, the Irish, the blacks, the South Asians, the Poles, the Nigerians, Somalians, Lithuanians, Romanians… the list goes on. Always, every single time, these “groups” represented leeches, takers, issues, trouble. It is this history then that gives context to the term “migrant” in the UK. “Migrants” come to the UK out of choice. “Migrants” are figures you can chart against “GDP” or “benefit claims”. “Migrants” are only worth sympathy if they simultaneously don’t take “our” low-paying jobs and don’t receive “our” benefits. “Migrants” are the opposite of “our”, they are the antidote to “us”. And therefore, migrants are black and brown… They are problems, they are numbers, they are not white. Increasingly, as I’m sure you can see, this list dehumanises the person who migrates. In the UK, “refugees” and “asylum seekers” are basically the same as migrants – no space is made to nuance the difference between economic migrants and people forced to leave their home due to war or disaster. It is this context then that the word “migrant” carries when it appears in the term “migrant crisis”. Less a crisis for the migrant, it conveys a crisis caused by people migrating; a crisis for Europe. The photo accompanying said BBC article. [shows white French policeman holding off groups of black people]. 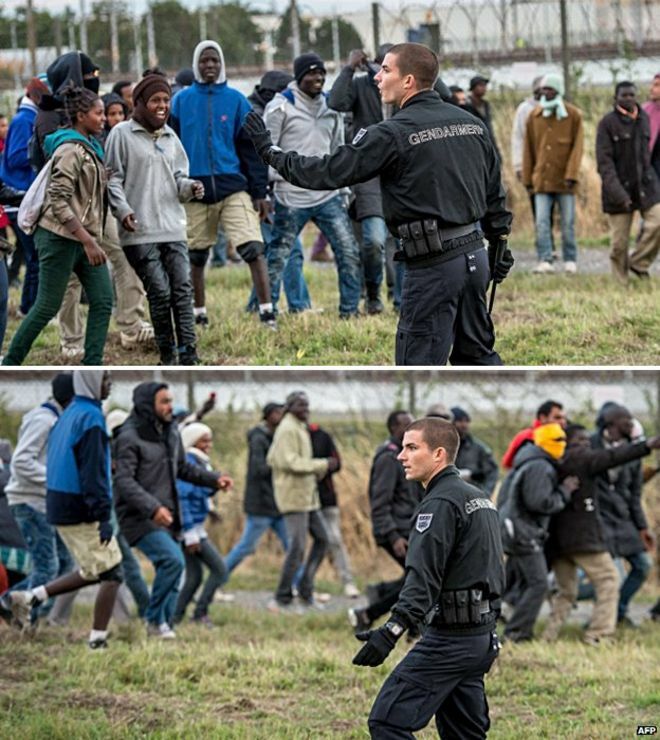 (Captioned: A French policemen trying to keep a group of migrants off a road near Calais). Within all of this, let us not forget that migrants are both gendered and racialised. The people in question at this particular time are people largely from Syria, Afghanistan, and Eritrea– primarily brown and black places. Not white places. And the people in question are largely imagined as “male”. It is widely accepted, at least discursively, that migrant men have often been particularly hated and feared for the danger and competition they bring to “native blood” and masculinity. Migrant men may “take” “our” women, and brown and black men are usually presented as hypersexual or deviant in their sexuality. All these intangible notions create the discourse and fear surrounding a “migrant crisis”. The crisis is not for the migrants themselves who are people, men and women and children, families, humans ,refugees, survivors of war and violence; no, the crisis is for Europe. As a BBC article well encapsulated it, “the problem, police say, is that there are simply too many to arrest and deal with.” The images we see are of white border-guards, white policemen, white men… surrounded by, threatened by, and “swamped” by black and brown men. Scary brown and black men. Angry brown and black men. Maybe the reason that photo shocked so many people was because we forget to see brown and black men as fathers. We forget that they could be emotional, they could love tenderly, they could have partners and homes. Black and brown “migrants” for Europe, but especially Britian, are racialised men. They are racialised because Europeans racialised them. “no we’re not migrants and no these aren’t guns”. 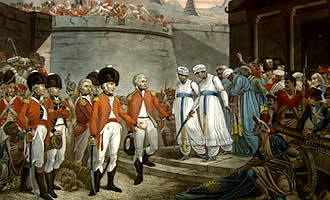 [Picture of painting of British Raj white troops in India]. Watching an interview on the news the other day, a line from one brown man in particular stood out for me. He asked, “If the British could come to Pakistan and live there, why can’t we come here?”…Why? That one question encapsulated the importance of the colonial relationship, power relations, racialised masculinites and racist discourse of Europe with “the others”. The British could go wherever they wanted and live there because they were colonisers. Because they traded violence and taught their superiority. The British could live in Pakistan (not yet a nation of course) because they were never migrants. And that’s the catch. The British have never been “migrants”. Even “ex-pats” aren’t migrants, they’re just Brits abroad. The man’s question highlighted everything dehumanising about this “crisis” and why it is able to continue. Because we continue to live in a colonial world. Because if you are a black or brown person fleeing from danger and trying to survive, you are a “problem” not a “human”. Because those coming into Europe do not have power and are completely at the mercy of the European powers. Because coming to Europe is deemed a privilege bestowed by the “owners” of whatever lands they choose. Because Europeans decided that the world could be “owned” and divided into “ours” and “not-ours”. Because the problems of non-European, non-white people are not problems of humanity and for human beings. They are problems for Europe. Next Next post: Intersectional, Radical, Unpalatable and Abrasive; that is the feminism I’m about.